I want to try the puffs – I like that they are made with Wisconsin cheddar cheese. The potato fliers in sour cream and onion look tasty too! That the cutely name “Original Tings” are potatoey goodness in a stick! They have eliminated trans fats and they are gluten free. They’re baked, all natural, and gluten free! Since one of my kids hates cheese, like they have Veggie Booty, no cheese. I like that they are baked, vegan-friendly and gluten free! I learned They have eliminated trans fats and they are gluten free. I like that you can purchase their 4 products online or use the on site store locator. I like that they are trans fat & gluten free. I like that they are gluten free! Thanks for the giveaway! I learned they are baked, all natural, and gluten free. I like the smart puffs which are made with Wisconsin cheddar. 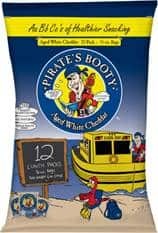 My kids and I love Pirate’s Booty but I had no idea it came in chocolate or New York Pizza! YUM! I learned that there are no additives used! these are gluten free and yummy! i want to try the tings! I would like to try the Smart Puffs. I had never heard of them before but they sound delicious. I had no idea there was a chocolate flavor Booty! Will have to find this somewhere near me, looks tasty. I like that there’s no trans fats! I like that they are trans fat and gluten free! Yay! and think the Potato Tings are such a fun name! My boys would like the Smart Puffs. My kids would love the Vegi booty. I like the Aged White Cheddar. 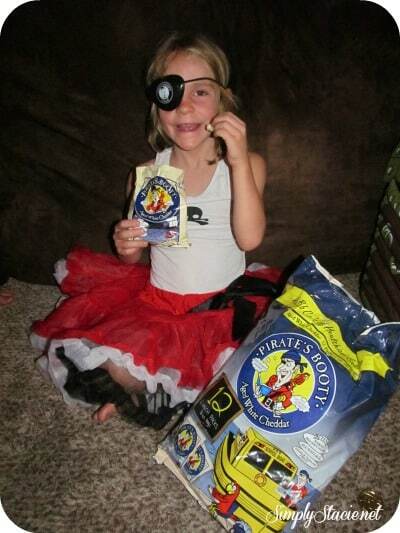 I learned that Pirates Booty is all natural, trans fat free, baked with 50% LESS fat! These are healthy snack items! I loved that it is baked and gluten free. I didn’t know that their products are all baked! That should make them a bit less guilt-inducing, right?? I’d love to try the Potato Flyers.